Since I recently wrote about Wakefield Cathedral Film Club's next film Jurassic World, I thought I'd choose another recent prehistoric themed picture. The Good Dinosaur is largely seen as the 'other' Pixar film from 2015, as it was released in the same year as Inside Out, more on that later I'm guessing. That being said despite Pixar having a few flops under its belt in recent years, the 'other' Pixar film is still not a damning term, especially for my generation who grew up with their films. 2015 was the first ever year Pixar released two films, and so comparisons based on that alone were bound to be made, but watching these films feels like a completely different experience. were many times in the film where I would be taken back by a stunning landscape only to be shot down by Arlo using words like "Papa" It's truly disheartening that they made a better looking dinosaur in Rex from Toy Story, which was released twenty years ago, and that you would think someone at Pixar would have pointed this out. While the visuals has some issues the soundtrack of the film is truly masterful. The film was originally to be scored by Thomas Newman who has produced noteworthy scores in the past for films like American Beauty (1999), Wall-E (2008) and recent James Bond films Skyfall (2012) and Spectre (2015). There is still a hint of an American Beauty percussion based style in the end result, and Mychael and Jeff Danna's take impressed me greatly. The music genuinely kept me hooked at some points. 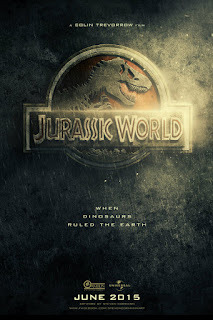 The film begins with an asteroid missing Earth, and jumps forward to our present day where Humans bizarrely haven't evolved yet dinosaurs have. The herbivores have developed a farming system, and somehow the English language. Our main character Arlo has two parents and two siblings, and is very much the baby of the family, easily getting scared by most things. The three siblings are brought up aiming to 'make their mark', meaning a literal mark on their crop silo, which Arlo has failed to do so far due to his fear. Following the loss of his "Papa" in a scene that loosely resembles Mufasa's fate in The Lion King (1994), Arlo finds himself lost miles away from home with the human child who unintentionally cost his Father his life . In order to survive the journey home he finds he must bond with the canine-like human. Arlo names the human 'Spot', as he behaves much like a Dog would, because this is apparently how evolution works. Spot at one point howls at the moon, which I found particularly annoying. While the film does a respectable job in attempting to unite these two characters it required too much suspension of disbelief for me to truly get behind it. Arlo as a character is constantly plagued by fear while Spot isn't, and this is what is used to draw us into believing the unity between the two, but this isn't enough. If someone who was responsible for my parents death and I was stuck with them, I would struggle to forgive them in the way Arlo does despite anything, and I don't think I'm alone in that. It simply doesn't feel logical and this is where the film lost me. Here is where the major issue with The Good Dinosaur lies. Pixar has shown in the past that it can create compelling characters using very little dialogue, so it baffles me why they chose not to with this film. Wall-E (2008) features no dialogue between two on screen characters until 45 minutes in, and not very much after that also. This shows me that Pixar knows how to create lovable characters without a word being spoken and yet The Good Dinosaur insists on going in another direction. I was interested to find that lead Writer and Director of Wall-E Andrew Stanton is credited as an Executive Producer for this film, but then so is original head of Pixar John Lasseter, whose pictures often involve humanising characters from Toys to Bugs to Cars. 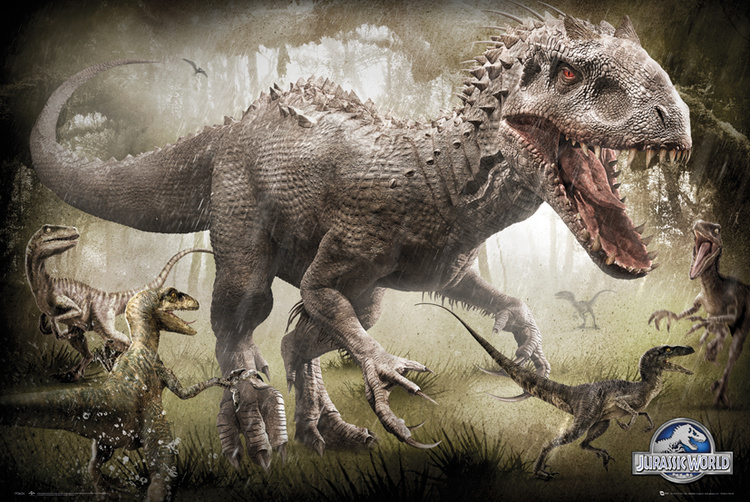 I get that they probably didn't want anyone to think it was too much like their previous work, but like in Jurassic World where Owen Grady names each raptor in his control, you don't need to humanise everything. Their differences to us are what make them interesting. To my mind the end result would have been much better with a silent protagonist relying on body language to draw the viewer in. As a minor criticism I don't really get what is 'Good' about Arlo Naive or Scared would have been more truthful. More bafflingly one of the films tagline's is "little arms big attitude", which makes even less sense as I couldn't find much attitude. Perhaps it got cut out of rewrite 47. This film suffered from well documented "story problems", which is to be read as "quality issues" that sadly weren't addressed fully. This isn't helped by director changes and release date delays, which are often bad signs. Toy Story 2 (1999) was completely rewritten and remade from scratch despite being almost finished because Director John Lasseter felt the story didn't work, yet it still came out on its originally announced date. Lasseter has since said that this completely drained him, so in Pixars defence I can see why they would want to take their time if they felt a picture wasn't working. 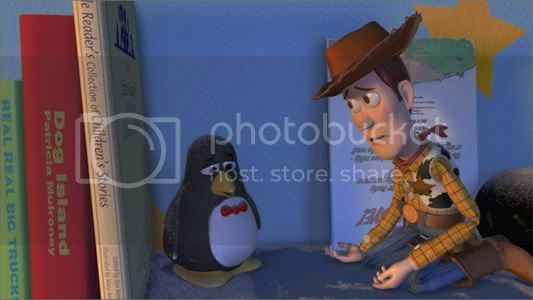 Many reviewers point to a specific scene where Arlo and Spot find a way to communicate the losses they have each experienced (pictured above) as a highlight, but to me this felt tacky and bolted on as a way to force these two characters together. When I watched this scene a second time it made me realise I would have enjoyed the story more if the roles were revered, if Arlo was somehow responsible for Spots parents doom. It was less like fine embroidery and more banging two pieces of wood together and hoping they stick. Who incidentally is also better animated than Arlo. "The note your shoe is squeaking." I wasn't originally planning to write about The Choir, or Boychoir as it is also known. I wanted to bury it under someones patio and pretend it hadn't existed. When I first saw the trailer I cringed. I cringed at the above E Flat exchange, at the use of Zadok the Priest, and at the use of Eddie Izzard in a dramatic role. Was the whole film going to be like this? Well, the answer is yes, but let me explain why that turned into a positive. The films trailer to me played like every underdog sports film ever, except the plucky underprivileged team in this case is a young boy named Stet. Yes, as in Stetson (more on that later). Stet is a problem child, who lives in a trailer with his alcoholic Mother and is prone to violent outbursts in school. His saving grace appears to be that he inexplicably possesses the voice of an angel. Stets life is turned upside down when his Mother is involved in a fatal car accident, and he is forced onto his absent Father who lives in New York. It becomes clear that Stet is a secret child, and so he is sent away to a musical boarding school so that he remains a shady secret to his wife and daughters. This becomes one of the most intriguing parts of the film. The trailer would have you believe that the films crescendo (see what I did there) builds up to "the most important concert in our schools history", a line that made me cringe. It appears to build to a big Zadok The Priest set piece at the end akin to the small town nobodies winning the Superbowl, World Series or insert your top prize here. The concert is important but by this point the film is more focused on Stet and his development. I liked the major twist that happens at this concert, despite the slightly ropey acting that made one choirboys actions unintentionally hilarious. I laughed at ropey acting a fair bit in this film, but to my mind that is better than if the film were boring. Much like Jurassic World where I played 'spot the product placement', in this film I played 'spot the American cliche', and this kept me very entertained. The phrase "knock it out of the ballpark" is used twice. TWICE! If you accept that the film is very American in every sense, the ride is a lot more enjoyable. The main character is called Stetson. The only way the film could get any more American would be to name his Mother Nascar. I know this sounds like a criticism but it isn't. I enjoyed this film more as a comedy than as a dramatic work, but at least that helped me enjoy it. 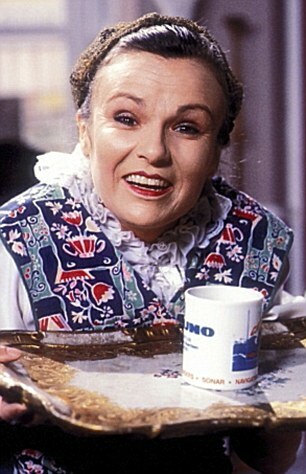 It is Acorn Antiques, not Crossroads, and that is fine. The single greatest thing in the film is Dustin Hoffman as Master Carvelle, as he has the best performed role and is a joy to watch. He is every grizzled veteran character ever, a teacher who is able to take even an unruly child like Stet and harness his talent. A scene about half way through the film best shows this as Carvelle tests Stet while bringing the stage lights up brighter and brighter as if to interrogate him about whether he truly has a passion for singing. Hoffman appears to know that he is playing chief stereotype in an entire film filled with stereotypes, and he seems fine with that, so I am fine with it too. 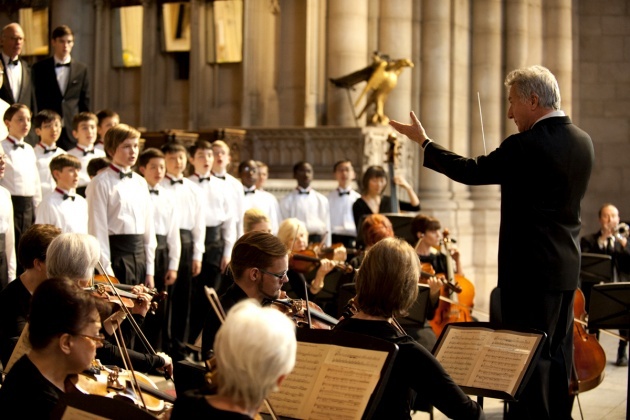 The musical performances in Boychoir are also a very enjoyable aspect throughout the film. I found Boychoir to be a far more enjoyable experience once I got past my skepticism brought on by the trailer and other things I had read. The Choir is consistently well shot and directed for the most part, though some scenes in Churches felt like they forgot to turn the lights on. 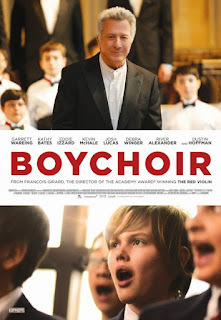 Aside from an ending you are either going to love or hate, Boychoir is worth 96 minutes of your time. I came to enjoy it as a nod to choral music with a Hollywood touch. Wakefield Cathedral Film Club is screening Boychoir on Monday March 14th at 7pm. Tickets cost £5 on the door and refreshments will be served. Our next screening is Alan Bennett's The Lady in the Van on April 18th.